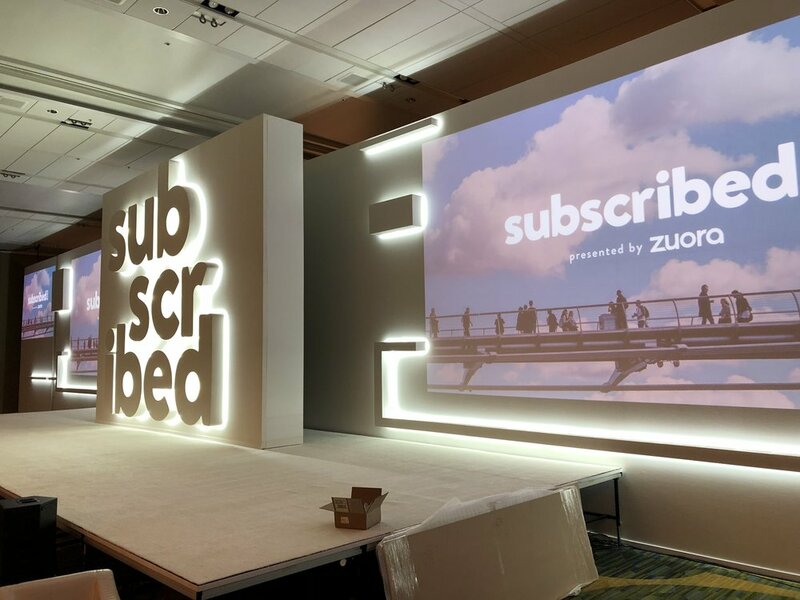 Zuora Subscribed Conference 2018 — John Murray Productions, Inc.
Zuora held their 7th annual Subscribed Conference this June at the Marriott Marquis in San Francisco, and John Murray Productions teamed with the audio visual masters at Immersive to bring the corporate theater set to life. The conference, highlighting the global economic shift in focus from products to users, came 10 years after Zuora's inception and has grown ten-fold in attendance since their inaugural event. It needed a look that was as big as the conference's growth, so we went big! Working from Immersive's designs, we began with a 110' wide x 18' tall flat wall set comprised of 5 sections: 4 projection surfaces and a large center wall. The walls were seamlessly wrapped in white muslin before the custom halo illuminated set pieces were applied. 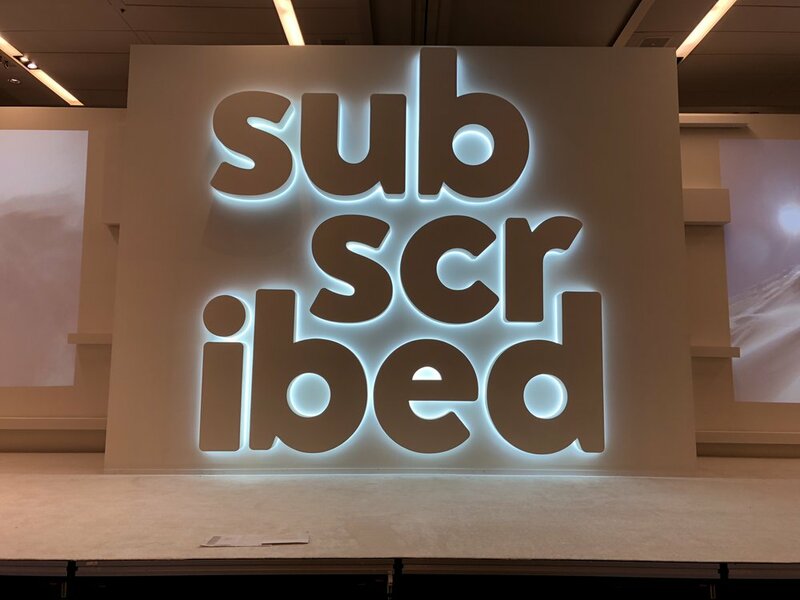 The focal point of the set was the companies dimensional SUBSCRIBED logo, which we fabricated using our CNC foam cutter. The giant letters and set accents were 4 - 8" thick, made from EPS foam and skinned with foamed PVC for a matte surface that the creatives at Immersive pixel mapped for a dynamic projection surface. We used over 450 linear feet of LED strip lighting from Prism Lighting Group to create the backlit effect, and the combination of illuminated surfaces gave the set an interesting dimensionality uncommon to an all white set. The challenge came in the form of a short install window which required a pre-rig of the giant wall in our shop, allowing the wiring to be tested and dimensional elements dry fit, ensuring a seamless install. The finished look was bright, bold and clean.